I won the roll and decided to go first. Admonition was on Mulg. Everything just run as far as possible (Mulg with Rush from Axer). Doomshaper cast Implacability (to negate Fyanna’s Gallows), put some fury to the Stone and charged Zuriel. Stone filled up to full and advanced. Legion forces mostly run and positioned for the next turn. 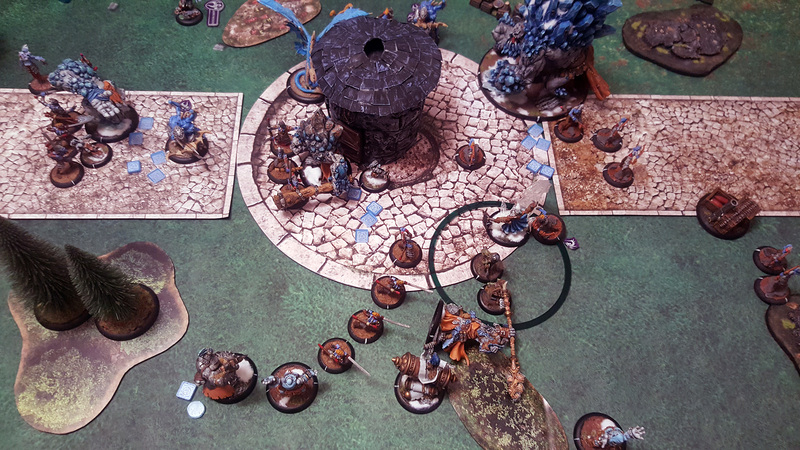 It turns out that Maciej put his Craelix and Anyssa to close and I managed to kill them both with Janissa Rock Hammer (it was lucky deviation if I remember correctly) and Rushed Mountain King’s spray. Additionally one Witch died too. 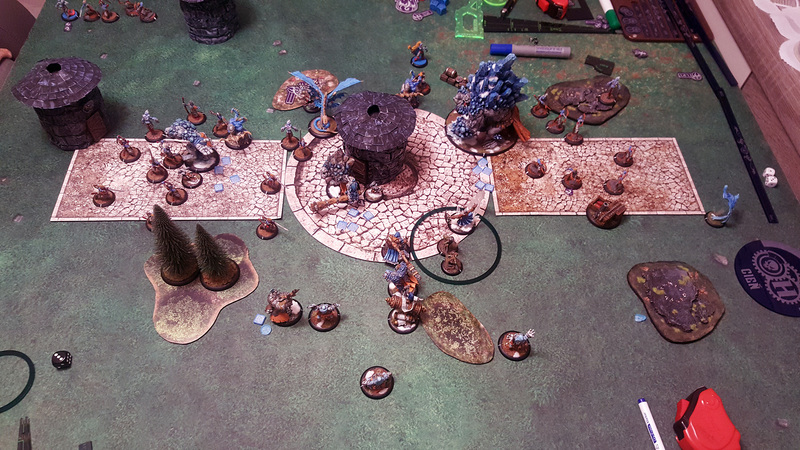 I run with Earthborn and Mulg (Rushed by Axer) to the hut and blocked line of sight staying base to base. Gobbers put theirs cloud, some Stone activates with no continous effects and some members hid in it. Feralgheist sticked to the right zone. Doomshaper cast Implacability again and FEAT. It was a mistake, Maciej said, beacuse he had only a few models which could charge mines and it was a waste of feat. Legion turn. Archers did a great job clearing whole Stone unit (only CA left). Janissa was also hit but survived. 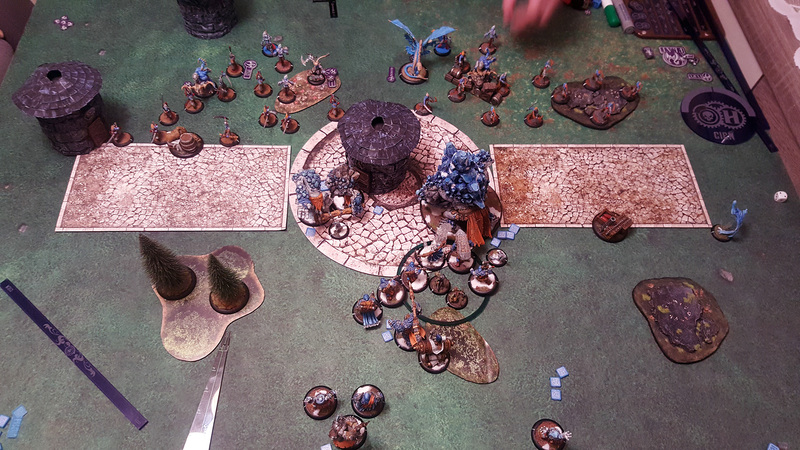 Maciej shot a Whelp I wanted to use as a fury management next turn. Fyanna countered with her FEAT (+3 def and Dodge). Some Swordsmen charged Mulg and after Primal Rage attack Incubus replaced one. I wanted to assasinate Fyanna, but I positioned Earthborn and Mulg badly and cannot get them to her. 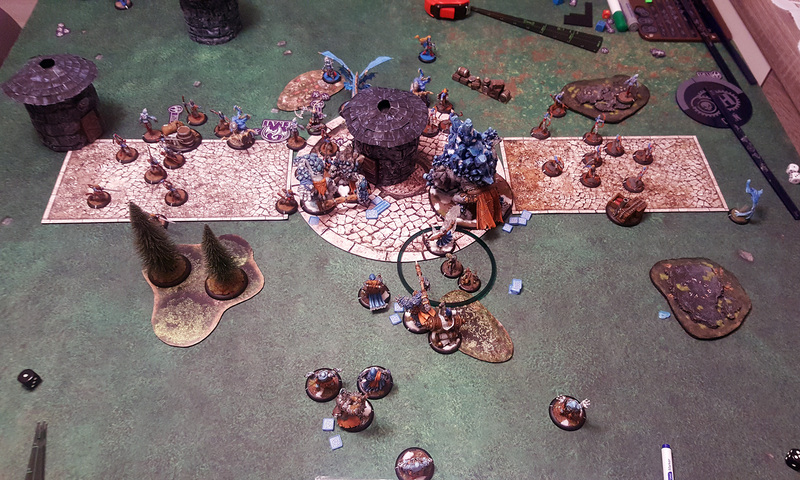 I decided to trample with Earthborn to objective. 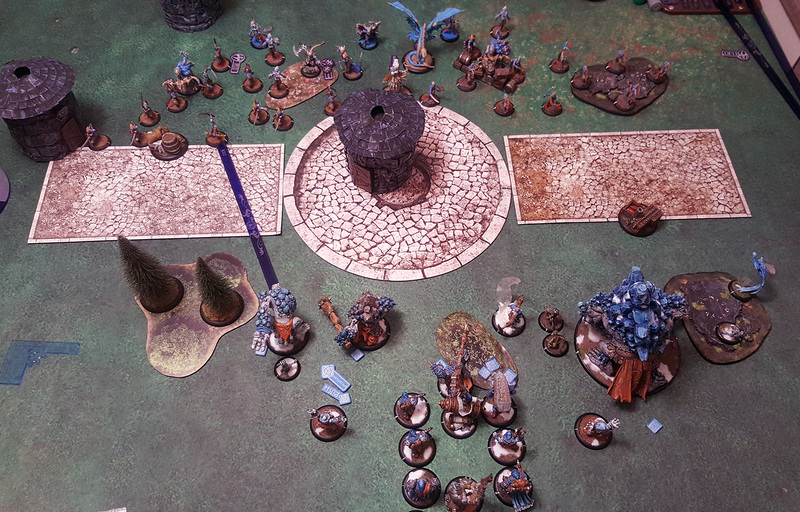 Thanks to a little above average rolls Earthborn smashed it with last attack 🙂 I was still tempted to try and hit Fyanna, so I charged with Mountain King and thanks to bulldoze, positioned well to spray over Legion’s warlock. I missed, even with reroll (Puppet Master). Another spray from Kill Shot also missed. 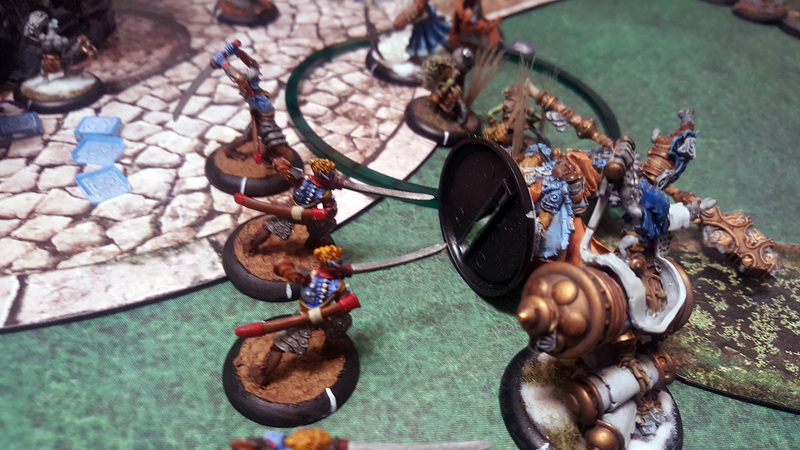 I should go for the Archers… Janissa cast Rock Hammer and killed 2-3 Archers. 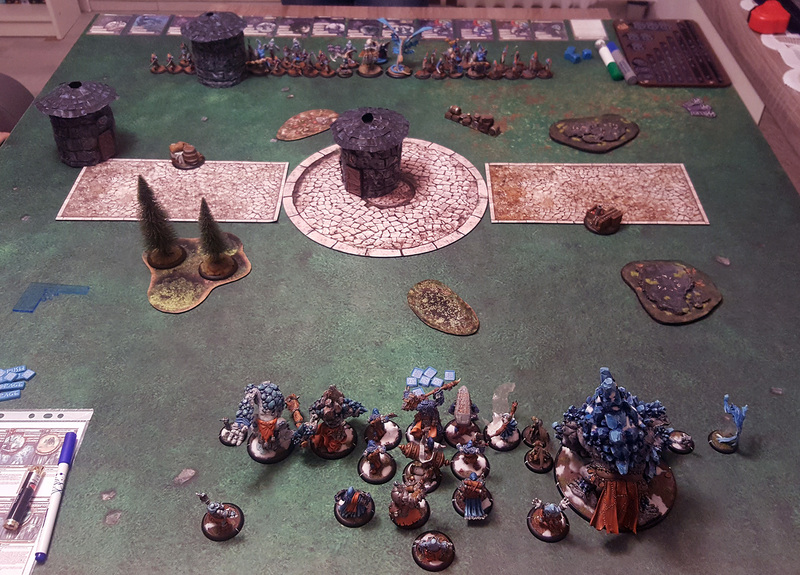 Previous Post:Game #14 Thagrosh2 vs. Jalaam1 – A short recap.